It should be noted that not all rashes or suspected insect bites are due to Bed bug activity. A change of bed linen, laundry products, deodorants and cleaning products can cause bite like symptoms. Static electricity and fabric fibres will also pierce the skin causing lesions that will itch. NPC fully qualified Surveyors will always undertake a survey in order to ensure that the correct course of action and treatment is recommended, dependent on the cause of the symptoms. Bed bugs are reddish-brown, with an oval body, 6 to 9 mm long and 1.5 to 3 mm wide. Following feeding the engorged adult swells and tends to be a dull red in colour. The female Bed bug lays white oval eggs which, are approximately 1 mm long. Whilst humans are the preferred host of bed bugs. Bed bugs will actually feed on various warm-blooded animals. 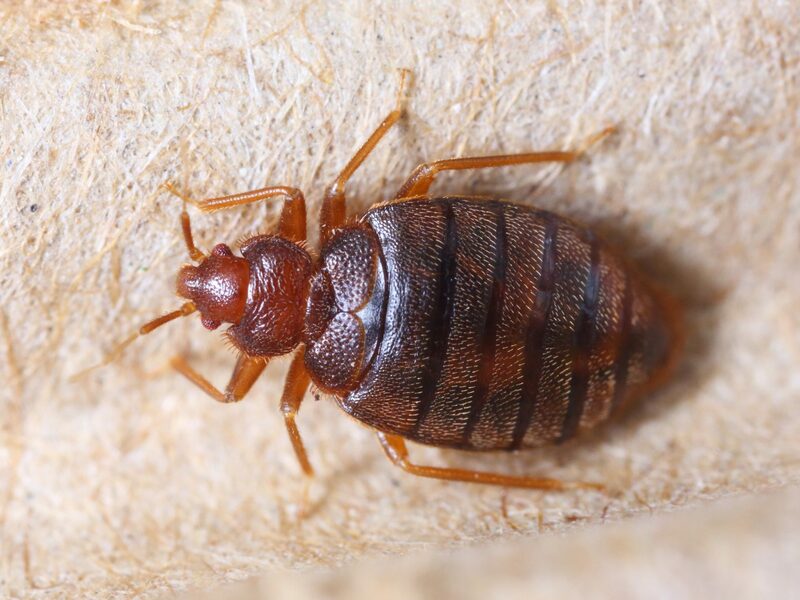 The Bed bug hosts therefore include dogs, cats, rats, mice, pigeons, rabbits etc. 1. The first sign of Bed bug activity will often be something that resembles mosquito bites. Mostly these bites will occur at night. However, in a serious infestation the bites can occur during the day. The Bed bug bite tends to swell and spreads out and this is what distinguishes the bite from that of a mosquito. The bites can come in lines and will burn, which is quite unlike a mosquito bite. The mosquito bite tends to stay round and neat in appearance. It is important to note that there is a delay between being bitten and the evidence of the bite appearing and the length of time of this is dependent on the individuals’ reaction time. 2. Other signs of Bed bug activity to look for are the bugs themselves and the light brown, molted skins of the nymphs (young Bed bugs). In addition, often by looking along mattress seams spots of dried blood, which are actually Bed bug excrement, can be found. Blood spotting can often be seen on the bed linen too. Occasionally the smell of dried blood or a smell similar to rotten raspberries will be present. 3. The name Bed bug often leads to confusion, Bed bugs can be found in any area where humans frequent and the surrounding adjacent areas. Therefore, it would be correct to say that Bed bugs can be found under desks, restaurant benches, on computers in the library, chairs and curtains etc. Bed bugs are very good at clinging onto fabrics. Transportation hubs such as train and bus stations together with airports are also key infestation stations to be wary of. Bed bugs can be found clinging to curtain rods, air conditioners, fans and inside electronics. 4. There is a stereotype that Bed bugs only occur in poor, dirty houses and communities. This is far from the truth. The fact is that many affluent communities and households also have Bed bug issues. Once a Bed bug infestation has been correctly identified, the NPC Surveyor will advise on the course of action to be taken. However, control measures will involve the use of insecticides to treat the room, furniture, fixtures and fittings. Adjacent rooms will also require treating and the rooms must remain occupied during the treatment period. However, the rooms to be treated will obviously need to be vacated during the insecticide application treatment period.